This DVD is genuinely one of the rarest in my collection. Very little footage exists on the great BILL PEARL, author of "Keys to the Inner Universe" and other well known books. He is also probably one of the world's greatest bodybuilding trainers. Bill has been the force behind many of the world's top physiques for the past 30 years, including the great Chris Dickerson, Mr. Olympia 1982. BILL PEARL is assisted in the seminar in Australia by his long time friend DENNIS TINERINO. Their Pearls of Wisdom cover such subjects as diet advice, nutrition versus drugs, training philosophy for bodybuilders and athletes, bodybuilding politics, contest preparation, sleep, pain barriers, injuries and much more. Any serious bodybuilder will be fascinated by the information given jointly by BILL and DENNIS in this master class seminar. It was shot only a few days after Dennis won the IFBB Professional Mr. Universe title in Sydney, Australia. He maintained his magnificent condition for the seminar as you will see during his flawless posing routine. BILL also presents his unique posing display in Australia with all his famous poses, making this DVD a true collectors' item. 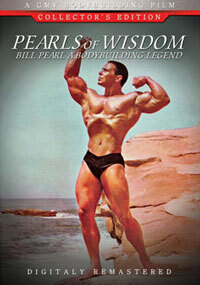 There is much more to this DVD than the seminar as it is a celebration of the life of Bill Pearl in Bodybuilding.